We don't know whether the most recent response to this request contains information or not – if you are Karin Mabberley please sign in and let everyone know. We're waiting for Karin Mabberley to read a recent response and update the status. http://i.dailymail.co.uk/i/pix/2018/01/1... This request relates to that post. The traineeship is stated to be open only to candidates from a black, Asian or non-white ethnic minority background. Under the FOIA please provide a copy of the criteria used to determine, either upon application or at interview, whether a candidate meets the race and ethnicity requirements. If it is based on skin colour, please provide a copy of the shade chart showing which shades are acceptable and which are not and explain how the recruiters were instructed to deal with applicants of light skin hues who, nevertheless, were genetically of black, Asian or non-white ethnic minority background. If based on DNA, please confirm that applicants were required to provide a DNA sample and state what percentage of DNA is required to be from black, Asian or non-white ethnic minority background in order to be acceptable. If based on some other test or criteria please provide full details. Please provide anonymous statistical data data about the racial and ethnic backgrounds disclosed on application and explain how applicants that exercised their right under the Equalities Act 2010 not to disclose these protected characteristics upon application were handled. Please provide anonymised statistical data about the racial and ethnic backgrounds of those selected for interview, in particular, were any applicants that exercised their right under the Equalities Act 2010 not to disclose these protected characteristics upon application, selected for interview? Please explain how an apparent discrepancy between stated race and/or ethnicity, and skin hue would have been resolved at interview. Again, provide skin shade charts where applicable. Please provide, in anonymised form, any contemporaneous notes regarding skin hue or genetic racial and ethnic heritage made at interview of unsuccessful candidates. The reference number for your request is RFI20180320. I am writing to request an internal review of British Broadcasting Corporation's handling of my FOI request 'Racial and ethnic criteria for employment'. 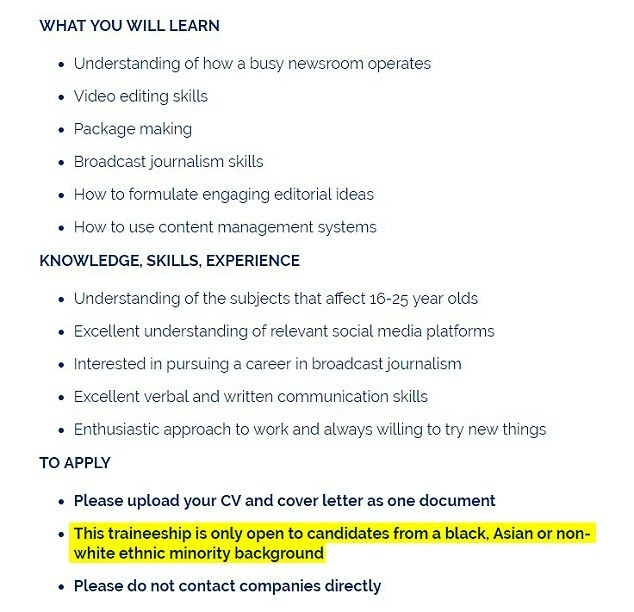 Frankly I find it extremely unlikely that no information about the criteria by which Creative Access define, use and apply the term "black, Asian or non-white ethnic minority background" (BAME) has been supplied to the BBC as part of its "Employer Partner" agreement. Quite apart from anything else, how could the BBC be sure that it was fulfilling its mission to place more "BAME" people into creative and leadership roles if it has no idea how the term "BAME" is applied by Creative Access to real people of diverse skin hue, DNA composition and ethnic background? How could the BBC possibly have satisfied itself that Creative Access is aligned with the BBC's stated objectives if the definitions of vague, subjective terms like "BAME" have not been explicitly and objectively defined between them? How can the BBC be certain that a person of light skin hue but "BAME" by DNA or a "BAME" person who didn't wish to disclose his or her ethnicity on the application would not be unfairly discriminated against by Creative Access' selection process? You don't appear to be taking your responsibilities very seriously if you haven't already considered and settled these issues as part of the contractual agreement between Creative Access and the BBC. I also find it very surprising if there is no BBC oversight of the interview and application process. In view of the many unfortunate instances where the BBC has unwittingly employed people who turned out to be paedophiles, I would it consider it negligent in the extreme if the BBC had, as claimed in your reply, no information and no interest whatsoever about the recruitment process for a presenter of a programme aimed at young people. I'd appreciate a bit more effort, in the spirit of the act, to provide some information.